When it comes to medical issues, I have to say that like most people I am a rather private individual when it comes to sharing details. However, since varicose veins and vein disease are very important concerns, I thought it was time to share some of my personal experience with this condition. Varicose veins should not be taken lightly by anyone who has them or may be likely to get them if a parent, grandparent, sibling or other close relative has them. Simply ignoring varicose veins could be a mistake and a potentially dangerous one at that. Consider this: According to statistics, 4 to 5 out of 10 men and 5 to 6 out of 10 women in the United States are suffering with a type of venous problem. I must admit that I simply ignored my varicose veins for years and years. I was well aware of them as time marched on. Year after year they became more and more unsightly on my right leg with their knotty and lumpy appearance like a snake that just swallowed a small rodent slithering right under the skin of my thigh and further down the leg. Sometimes my legs bothered me where they felt achy or heavy by the end of the day but at the time I didn’t really correlate this consciously to my varicose veins. I conveniently blamed it on the weather or something else that seemed to make sense. As time went on and the aches and discomfort (especially in my right leg) became more frequent, somewhere in the back of my mind I recalled that my dad and my grandmother both had sizable varicose veins. I also remembered them frequently complaining about pain in their legs. I understand now that their pain more than likely was caused by their varicose veins because the aching and pain is what made me more conscious of my own just a few years ago. Until my varicose veins started to cause pain on a regular basis, they were merely a “cosmetic or appearance” problem to me. It was embarrassing but it could be fixed easily by not wearing shorts anymore. Out of sight out of mind was the going strategy. As more time passed my legs became very bothersome, often on a daily basis. They began to feel achy and heavy for no apparent reason. I finally decided to investigate this nagging problem further and sought medical advice. After seeing my primary care physician I was granted a referral to a vein specialist for further evaluation. To my shock and dismay the vein specialist immediately pushed for a rather radical approach of cutting and stripping the problem veins right out of my leg. I am ordinarily not the squeamish type but this approach of cutting and yanking the veins out was rather unsettling and struck me as a little too drastic of a solution. So I thanked the good doctor for her advice and told her I would think about it, well aware that this was not going to happen if there were other options. This news flash was a major incentive to educate myself on the topic of varicose veins and explore all possible alternatives. On my way home I also remembered that my grandmother used to wear these elastic type stockings all the time for her leg discomfort and probably also for the pain from her varicose veins. At this point that did not sound like an appealing remedy to my leg issues either. Aware that the aching and heavy feeling legs and bulging veins were a problem that needed to be addressed, I went on a mission and spent countless hours researching all facets of vein disease and possible treatment solutions. My focus was also geared toward finding the least invasive solutions that required no cutting or pulling veins out of my legs. As a side note, while doing all my research the wealth of knowledge I gained in the process also sparked the idea for this blog. I wanted to share all my findings with other people all over the world who had similar problems and to help inform about many of the issues involved with vascular disease and the usefulness of compression stockings as a treatment option. Vein disease can manifest itself in many ways. For example, it can occur as deep vein thrombosis (DVT), pulmonary embolism (PE), phlebitis, varicose veins, spider veins or simply swelling, inflammation or tenderness. In my own research I found that the treatment options that are available depend largely on how big the varicose veins are and also on the type of symptoms and skin conditions that are associated with these enlarged and bulging veins. Rest and elevate your legs whenever possible to help prevent pooling of blood and fluid in the legs. Wear graduated compression stockings, compression bandages or other compression devices. Graduated compression socks or stockings help squeeze the enlarged vein back down to a size where the muscle contraction can effectively assist in pushing the blood back up the legs to the heart and lungs to be re-oxygenated. Sclerotherapy. Diseased veins are injected with a foaming agent or liquid to collapse and close the damaged veins permanently. The closed veins eventually get absorbed by the body and the blood is re-routed through other still healthy veins. Laser surgery and catheter assisted removal of the enlarged veins. These methods also serve to collapse and close the diseased veins for good after which they will gradually be absorbed by the body. Vein surgery and vein stripping. Surgery and complete removal of the no longer functional vein from the body is usually performed on an outpatient basis. Surgery and vein stripping is usually only performed on varicose veins that cannot be treated with other less invasive methods, for example if the vein causes problems with blood flow or if the increased pressure in the vein causes skin changes or sores. Risks from vein stripping can include bruising, scarring and nerve injury. Regardless of the promises and claims of various treatments advertising themselves as “permanent” solutions, patients should be aware that varicose veins can reoccur in spite of the effectiveness of treatments. In addition, it is important to know that many insurance carriers will not cover surgeries and procedures for varicose veins and spider veins that are considered cosmetic. Can Compression Stockings Help with Varicose Veins and Spider Veins? After absorbing all the information and possible treatment options for varicose veins, at the ripe age of 52 I decided to start with the most conservative approach of wearing compression stockings. Unfortunately compression stockings are not a cure for the underlying vein disease. Nevertheless and to my own surprise I found out that they can do an amazing job in reducing or eliminating the associated symptoms and discomfort of feelings of heaviness, achiness and pain in the legs from the varicose veins. Compression stockings come in different classes of compression levels. In my case I found the compression range of 15-20 mmHg or 20-30 mmHg to bring nearly complete relief of my symptoms. Even after being on my feet or sitting for long periods of time my legs feel great with compression stockings. I intend to continue wearing compression stockings religiously with the hope of avoiding surgical intervention and removal of my great saphenous vein, which is be biggest culprit of my varicose veins, for as long as reasonably possible. I always try to put my compression stockings on immediately after waking up before the enlarged veins in my legs and feet have any chance to fill up with stagnating blood and fluids. Gravity force is the enemy of varicose veins, forcing the blood back down the legs because the defunct valves inside the veins have quit their job and are no longer helping to push the blood back up the legs to the heart. Your heart will also appreciate the help because it does not have to work as hard with the compression stockings squeezing your veins back in shape, which allows the blood to flow faster and more efficiently. As an added bonus, the compression stockings also make my legs look better and perfectly smooth, covering up the ugly twists and bulges of varicose veins. If you are in your twenties or thirties you may be thinking “I’m glad I don’t have to deal with these types of issues”. But let me tell you – don’t be fooled. Just because you cannot yet see or feel the effects of vein problems does not mean they are not there. 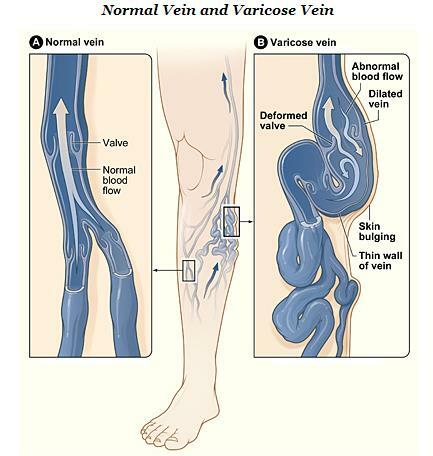 Be alert and take a good look around or even ask if anybody among your immediate family or relatives has venous issues. If they do, it may be wise to talk to your physician and consider wearing compression stockings to help keep your leg veins healthy. Even if you should come up empty, it may be wise to consider wearing support hose or even better graduated compression stockings of a lower compression range like 8-15 mmHg, to give your leg veins a boost. The upshot of it all is that you can never start too early to protect the health and longevity of your veins. Wearing support hose or compression stockings is a miniscule effort to lessen the risk of increasingly serious consequences resulting from deteriorating veins. What Risk Factors can Increase Your Chances of Varicose Veins and/or Spider Veins? Excess weight – obesity or being overweight can increase the pressure on your veins, which can result in varicose veins. Pregnancy – being pregnant significantly increases the amount of blood in your body. This also increases the workload for the veins to transport all that blood, which can cause them to become enlarged. Luckily in most cases varicose veins improve within a few months after giving birth. However, usually with each subsequent pregnancy additional spider veins and varicose veins can develop. Hormone changes – taking birth control pills or other medications containing estrogen or progesterone may result in developing spider veins and/or varicose veins. Your genealogy and medical history – Having a family member or relative with venous issues or being born with weak vein valves increases your odds to a 50/50 chance of getting varicose veins. Leading a sedentary life style – Spending most of your waking hours sitting or standing puts more strain on your veins because they don’t get any help from the muscle pump action of your calves. Age – with advancing age the valves in your veins may weaken or stop working entirely. Sunlight exposure – individuals with very light skin are prone to developing spider veins on their nose and/or cheeks if they enjoy sunlight too much.